For those who want their wedding to be an adventure to remember, Rev. Amber Desmond, an ordained minister, avid hiker and adventurer,offers her services to couples who dream of a wedding in their own private paradise. 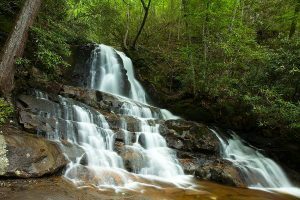 Familiar with the trails, waterfalls and scenic vistas of the area, Rev. Amber will lead you to an agreed upon location where she will perform a wedding you have chosen and personalized. Rev. Amber’s hiking partner, Zach Brown, of Brown Mountain Light Photography is available to accompany you on your adventure and document your day, your ceremony and the view with beautiful photographs. Rev. Amber and Zach are also available for zip line weddings and white water rafting weddings. Contact Amber to begin planning your adventure in the mountains of Western North Carolina. Send Amber a message through the contact page of this site.